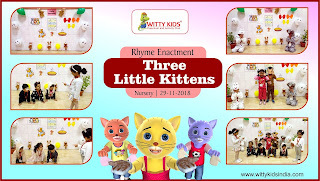 Nursery rhymes are important for young children because they help develop an ear for our language. Both rhyme and rhythm help kids hear the sounds and syllables in words, which helps kids learn to read! On 29th November, 2018 little wittians of Nursery class at Witty International School, Udaipur came beautifully dressed up as kitten, mumma cat and mouse for the rhyme enactment of “Three Little Kittens”. They enjoyed being in the characters they came dressed as. Class was decorated with cutouts of cat, kittens, mittens, pie and mouse. They enthusiastically enacted the rhyme with their peers. It was a fun loving experience for children.